I’ve finished the first patchwork quilt I started about 3 weeks ago and I’m very pleased with it, as is KayCee who brings it down with her in a morning and wraps it around her while she’s waking up! Ella keeps asking when hers is going to be ready. I’m going to try and make a start today but I’ve got so many projects on the go, it’s hard to know which to do first! I’m currently sanding down a chest of drawers so I can repaint it, I bought herb and flower seeds at the weekend and want to get on with growing things. I’ve got a bookcase to sand down and repaint as well as Ella’s quilt to make. I also want to sew some sheets together that will fit each of the small mattresses that are on the girl’s beds. Regular single sheets are too big and slip around due to the mattress protectors. I’m going to sew two sheets together so that the mattress can fit inside the sheets like a duvet fits in its cover. Hopefully, this will stop Ella throwing her sheet on the floor in the middle of the night! I really wanted to get pictures of the finished quilt on my blog today but I’ve lost my camera cable so I’m going to finish the sanding then find my cable. I’ll hopefully be back later! 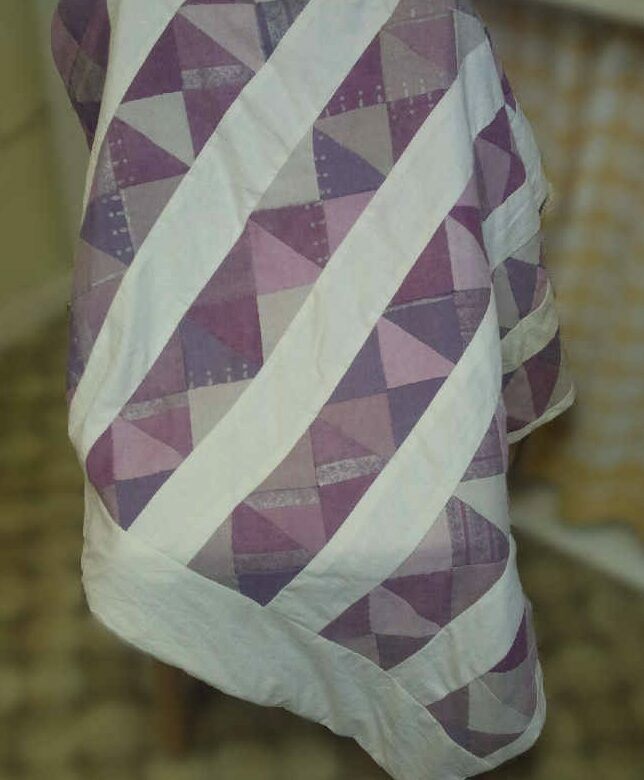 So here it is…..my first patchwork quilt made from an old curtain, 2 old sheets and an old duvet for the filling. It cost me nothing (as long as you don’t count the sewing machine I bought last week!!) and I feel great that I’ve used unwanted material that would normally have ended up in the recycle bin. Ella wants hers making now so I’d better hurry up and get the chest of drawers and bookcase finished so I can start her quilt!